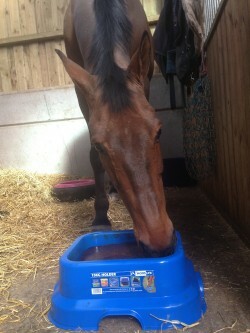 Bonnie Fishburn’s blog: Things don’t always go to plan! “I always find the first few months of a new year a really busy time. Not only is it a more tricky time of year to look after horses with the bad weather but also it’s the time of year where I am getting my horses back in off holiday and preparing them for the coming event season. I had 4 horses to get fit, until recently when I took on another horse, so we’re up to 5, so it was like a full time job before I had even been to work. We have getting out and about doing lots of training competitions, like dressage, Showjumping, BE Jump Training, combined training and arena eventing. Because of all the horrible rain we’re having I decided to register my 3 for British Showjumping, so that we could get some good practise over well built tracks. They have all been very well behaved but Florence has been a particular star, getting placed in two of her three outings and almost winning her registration fee back. 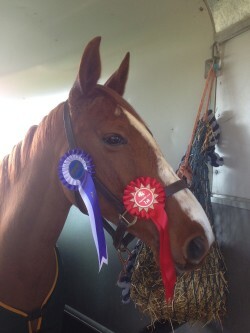 Percy was also very clever to pick up a 1st at his BE Jump Training. Dudley and the new girl, Cherry, are less experienced then my three so have been busy doing unaffiliated combined training and arena eventing. Dudley is an ex-racehorse that suffers a bit with stage fright, for some reason he gets nervous when there are people about, so I’m getting him to as many little places as possible before we go eventing again. We’ve actually had a few successful outings with Cherry winning 2 of her three outings on 69% and 70% with clear jumping rounds. Dudley has been getting braver, picking up 4th, 3rd and 6th. They have now been cross country schooling to and are hopefully ready for their first event next weekend. On 5th April I took Percy and Florence for their first British Eventing Horse Trials run of the season. Things really didn’t go as planned. All their training leading up to the event had been perfect, but I forgot to train them to go in a bog!!! The going at Stafford was extremely muddy and holding and neither of them enjoyed it. 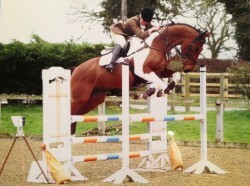 They were both in the BE100 and tried their hardest in the dressage picking up 31 and 35, but they were struggling. And the same with the Showjumping, they tried their best but Percy picked up 12 faults and Florence 4. They are both usually so careful. I should have retired at that point but I thought I would give the cross country a go, as it hadn’t seemed such bad going when I walked it. So I headed out on a very unhappy Florence, who stopped at 3 different fences before I retired and walked home. I’m devastated for her because she’s had very few faults in the past and really just didn’t enjoy the mud. I decided to call it a day so withdrew Percy, he is younger and has a lot less experience and clearly struggled in the mud Showjumping so didn’t want to risk upsetting him. Let’s keep our fingers crossed for some dry weather before their next event.